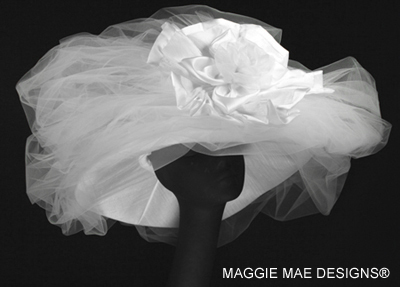 MAGGIE MAE DESIGNS® features custom bridal hats for the bride-to-be on her special wedding day. 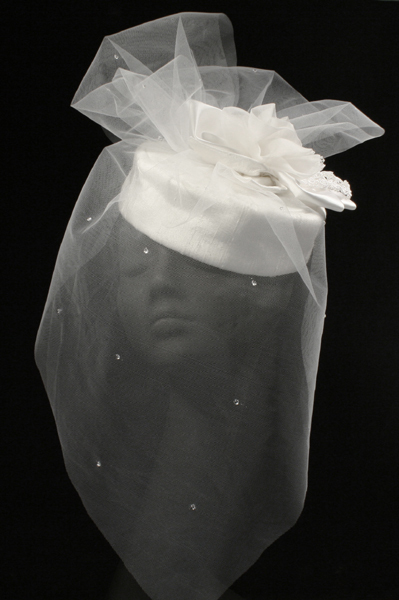 Every hat is individually handcrafted, sized to fit and designed to make your dream of the perfect wedding day come true. 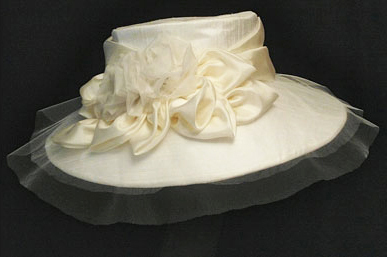 For additional bridal hat design ideas, please visit the Mother of the Bride hat collection, Cocktail hat collection, and also the Wedding Hats page. And please be sure to visit our new! Hair Ornament Collection which has just arrived for spring! 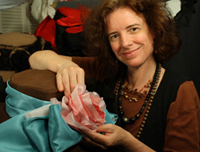 For those of you who are interested in a one-of-a-kind custom hat design, please visit the Designing a Custom Hat webpage to learn about this exciting process, and email Sally with your questions and ideas! 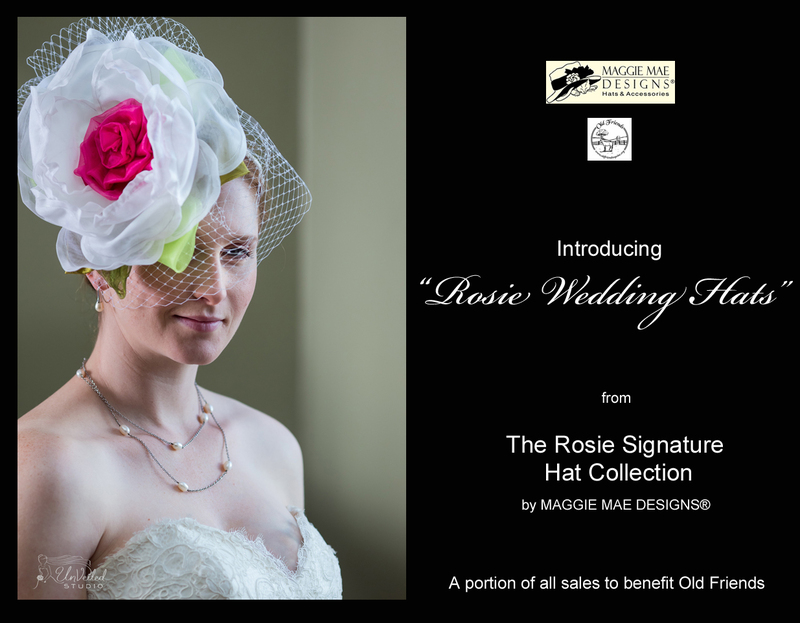 Please request a price list for the “Rosie Wedding Hats”! 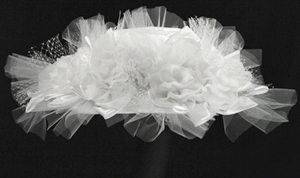 Call or email for a Bridal Hats price list, and please specify if you would like additional price lists as well. If you do not receive a requested price list quickly, please either call Sally at 508-430-1626 or check your spam folder as sometimes a spam blocker can inadvertently prevent you from receiving emails from a new source. Liza - You always dreamed of a wedding day that would make you feel like a queen - the kind of day that dreams are made of... With a soft, sweeping style, Liza is the ultimate wedding hat, providing the perfect palette for tulle and roses. Ashley - Just imagine yourself on your wedding day covered in white silk roses and wispy tulle, and you are imagining Ashley. 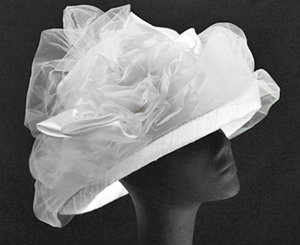 Just one of the stunning new wedding hat designs for the 2016 wedding season that will make any bride sparkle with soft, textured elegance. 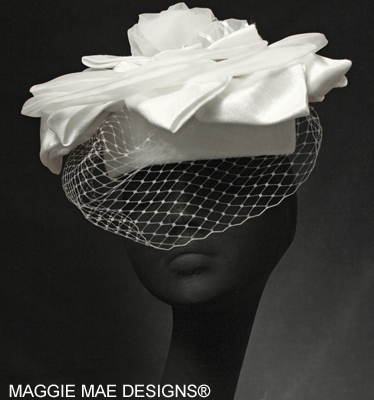 Tess - For the bride who likes the idea of a "top hat" design with all the romantic elements of the more traditional wedding chapeau. Decidedly unique, utterly feminine. And what fun to add some color to the design for a truly unique and elegant look! 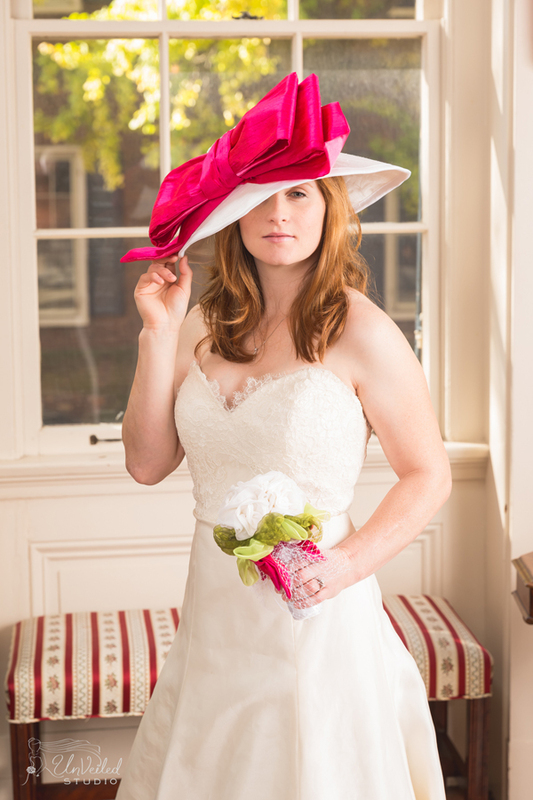 Layla - Maria wanted to feel like Eliza Doolittle in My Fair Lady on her wedding day. 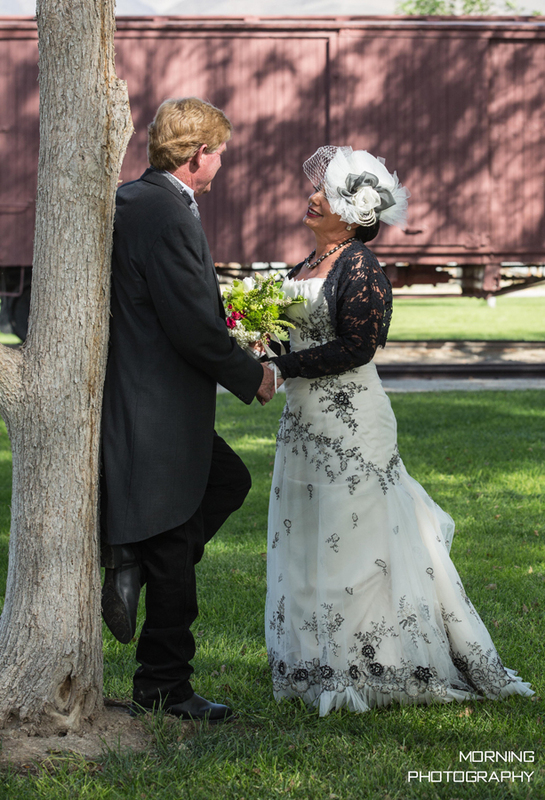 She needed to look no further than the new Layla chapeau at MAGGIE MAE DESIGNS®, a stunning wide brim wonder of silk and tulle that made Maria feel like she could have danced all night! 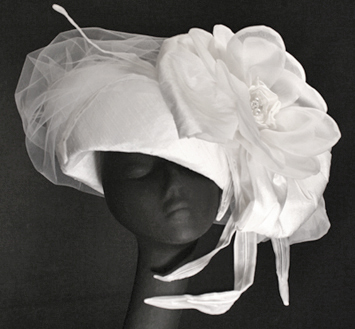 Juliette - Si française and right out of the 1920's and 1930's pages of Vogue, the Juliette cocktail hat makes a stunning statement for any bride. 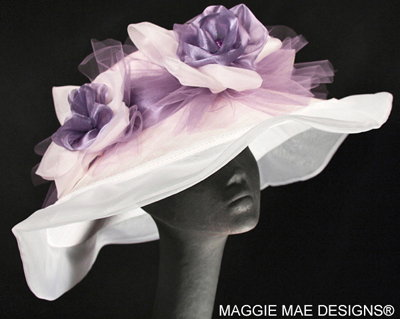 Perfect if you do not want to wear a big brim hat for the ceremony but still want to create that feeling of elegance. Sasha - Bold innovation. Stunning lines. 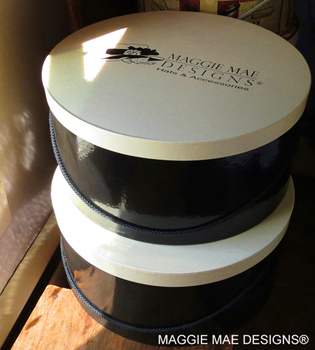 Couture millinery at its best. That's the Sasha. And the two of you are sure to make an entrance that no one will ever forget... And those long wispy white tulle tails add a new take on the traditional bridal veil. Fern - The Fern is all about the leaves - and sparkle. 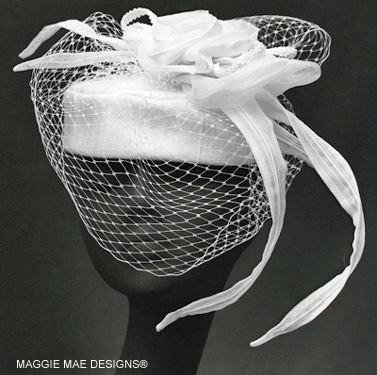 A wonderful bridal cocktail choice available in either white or ivory, with a splash of hat veiling that adds just the right touch of elegant mystery. 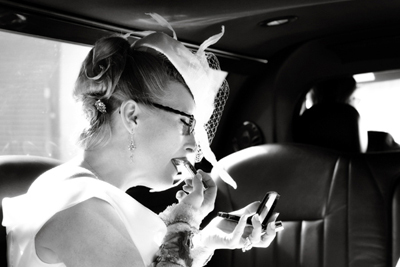 Perfect for a traditional wedding or more contemporary affair! Heather - Some might call this new design a cocktail hat, others would say she's got more substance and body than a fascinator. Why don't we simply say -- she's stunning...? Jessica - The cocktail hat is back! Full of innovation, this little gem sparkles with buttons and beads. Simply dazzling. 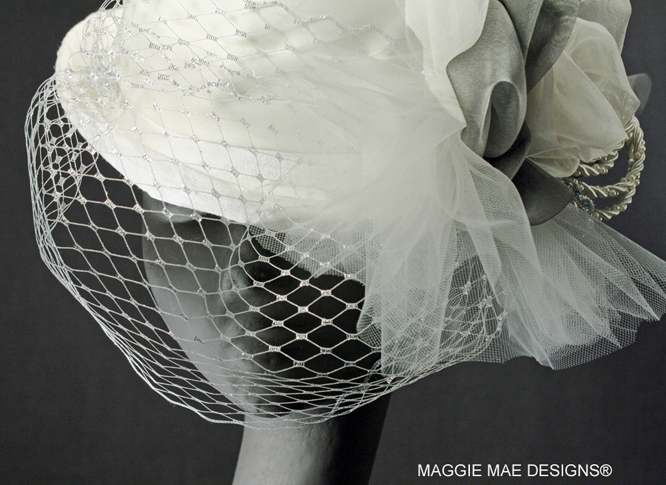 The Jessica features an innovative new MAGGIE MAE DESIGNS® trim idea -- silk organza "feathers" that move and and dance! 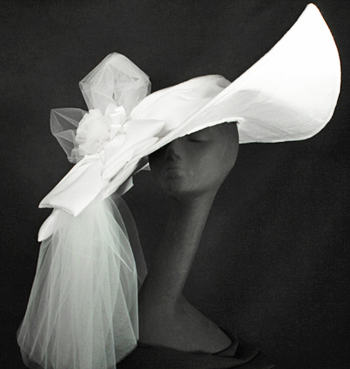 featuring the “Jessica” cocktail chapeau! 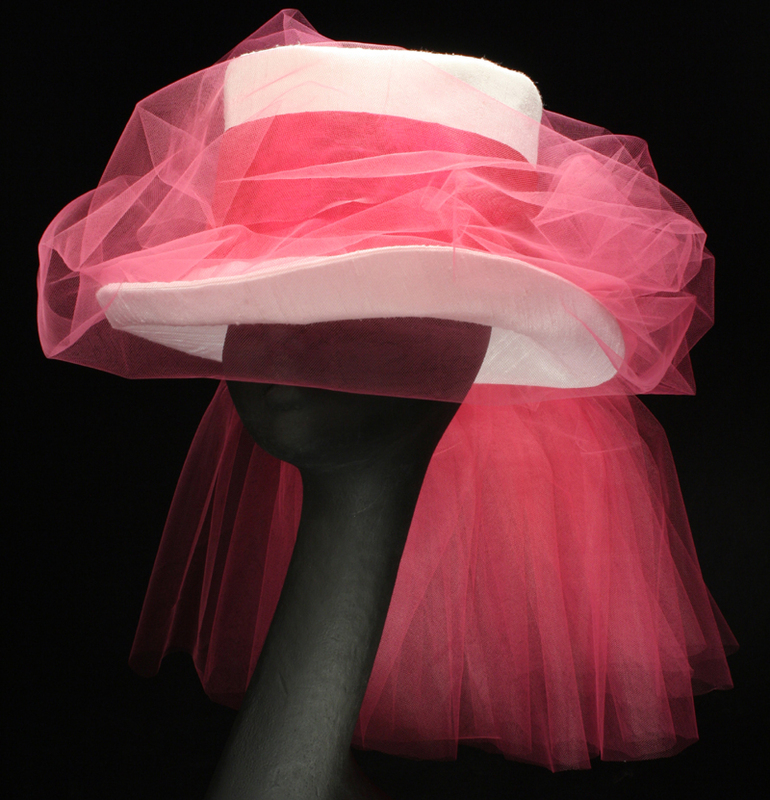 Sophie - The Sophie is akin to the Chelsea but with the wispiest of tulle overlays extending over the brim edge that sets her apart. 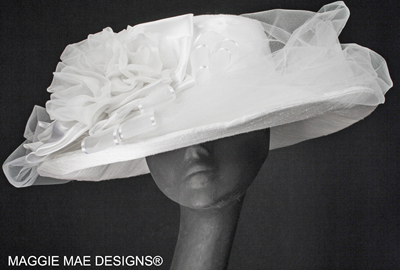 Reminiscent of days gone by yet with all the style and elegance that would be perfect for wedding or an elegant tea. 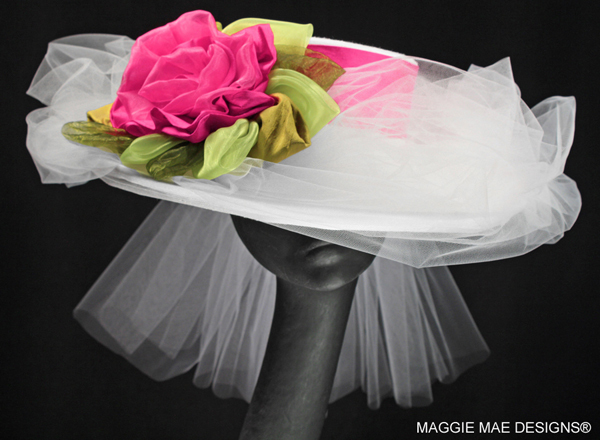 For other wedding hat options, please visit the Wedding Hat Collection as well as the Derby Hat Collection page for additional design ideas like this one! 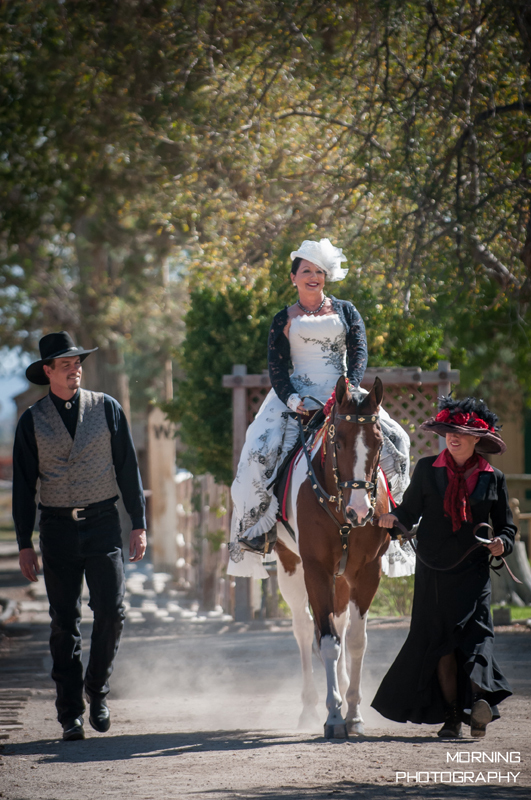 MAGGIE MAE DESIGNS® would like to share a very special wedding experience with the Wedding of Emily and Jack, compliments of Person + Killian Photography!